A pair of bronze root sculptures titled "Romeo & Juliet"
Sculptures will be sited around the Visitor Center and along a 0.6 mile paved walk from the Visitor Center to the ever-popular Maze Garden. They rise in scale as the landscape changes from intimate gardens of roses, dwarf evergreens and bright perennials to quiet groves of towering oaks and pines. Is it art framed by nature or nature framed by art? The interplay invites your participation, to see what's around you with fresh eyes. Plan to refresh your natural spirit through the seasons. 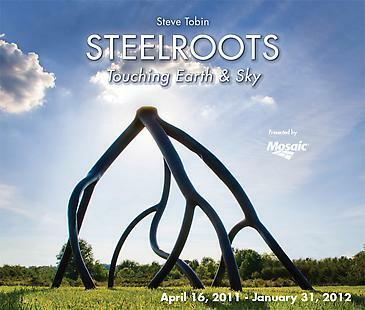 Steelroots sculptures range in color, deep black, ethereal white or rust-toned patina. As the Arboretum landscape shifts from misty spring green to verdant summer, fall russet and gold, then winter's hushed snows, each seasonal change brings new dimensions to the work.